We were thinking about having a trail maintenance day at the Audubon Natural Area anyway, but the fierce winds in the last week of February sealed the deal. The maintenance work and fun will occur on at 2 p.m. Sunday, March 6. We should be done in an hour or so, unless we while away some time watching some of our winter birds that will still be there, easy to see without leaves on the trees. So come on out and get an hour of good late-winter exercise. It’s time to think about Spring, at least as far as Brown-headed Nuthatches are concerned! Nuthatches are early nesters, so if you have a nest box for nuthatches (one with a 1” or 1 1/8” entrance hole), be sure that it is cleaned out and ready for these special birds to move in. Wasps can be a problem for cavity-nesting birds, and the safest way to prevent them is to rub a bar of Ivory Soap on all inside surfaces before the nesting season begins. The picture (below), taken by Dennis Burnette on Jan. 27, shows what the first stage of nest construction looks like, and just how early nest boxes can be used. 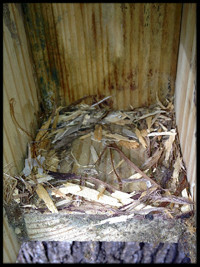 Don’t forget to report any nesting attempts in your nuthatch box to theTGPAS group site on nestwatch.org. We’re interested in any results from the boxes that members of our chapter have set up. Let’s celebrate spring by searching for early spring wildflowers! Join naturalist Ann Walter-Fromson for Wednesday morning wildflower walks in March and April. We will visit several watershed trails and area parks and preserves to observe nature’s beautiful show of ephemeral spring wildflowers. These are joint field trips with the Triad chapter of the NC Native Plant Society. The dates for these walks aren’t in the regular 2016 TGPAS calendar so please be sure to save the dates. A printed list of the dates and locations will be available at the next meeting..
You’re welcome to join in for any or all of these walks. Wear sturdy walking shoes, as trails may be muddy or slippery in places. You may want to bring binoculars (close-focus binoculars are particularly good for viewing small flowers), a wildflower field guide, a camera, water, and a snack. No pets, please. We will meet for each trip at 9:30 a.m. in the Whole Foods parking lot under the Sears Plaza Sign closest to Friendly Avenue between BB&T and Chick-fil-A so that we can carpool to our field trip site. We expect to return by noon. Please contact the trip leader at annwf7@gmail.com if you are meeting us at the walk site instead of carpooling. March 16 – The Bog Garden: We start at the entrance on Starmount Farms Drive and take the Nell Lewis Trail, which is short but steep in places. We will search for the earliest spring wildflowers and get an introduction to key features to look for when identifying plants. Less than 1 mile of walking. March 30 – Townsend Trail: We begin at the Yanceyville Street trailhead and walk about a mile east, looking for Bloodroot and Hepatica. About 2.5 miles of walking; the trail is moderately hilly. April 6 – Northeast Park: We start on the Buffalo Creek Trail in search of Spring Beauty, return to the Low Water Crossing area, then head a short way along the Reedy Overlook Trail to look for wildflowers in the bottomland forest. About 3 miles of walking; Buffalo Creek Trail is moderately hilly. April 13 – Marie Poteat’s farm or Richardson-Taylor Preserve. Check TGPAS Facebook or TGPAS and NCNPS emails for more information closer to this date. April 20 – Laurel Bluff Trail: We start at the North Church Street trail head and walk west through woodlands overlooking Lake Townsend. About 3 miles of walking; this section of the trail is quite hilly. April 27 – Beech Bluff Trail: We begin at the Brass Eagle Loop trailhead; after walking through a low wet area, we climb a steep hill to the bluffs overlooking Brush Creek, which host a wide variety of spring wildflowers. About 1.5 miles of walking. Our State magazine will feature T. Gilbert Pearson in an article in its April issue, which will be available in late March. A writer from the magazine chatted with Jack Jezorek about our Audubon chapter, which is named for Pearson. Barbara Hughes and Sue Cole spearheaded the repair of predator guards on the bluebird trail at Lake Daniel Park. They gathered the needed items to replace the wire mesh tops to the guards which had come loose or otherwise failed over the years. To replace the mesh, solid caps were found which fit snuggly on the end of the stovepipe guard. The only problem with a solid cap was that a hole had to be drilled in the center so that it would fit over the mounting pole. Tom Wear added a little tool consultation at this point. Any job is easy with the right tool, in this case a 1-1/2 inch hole drill bit. The job was done and the bluebirds are now better protected. The Audubon North Carolina Annual Meeting will be held on May 13th to 15th in Winston-Salem, hosted by Forsyth Audubon Society. The schedule will offer many great birding trips, good food and conversation and useful information about birds. On-line registration will begin in early March. This is a weekend to not miss, so mark your calendars. More information will be coming soon. Pearson Audubon member Lynn Allison shot this nice photo (below) of a Tufted Titmouse coming in for a landing to join a Northern Cardinal on her feeder on Feb. 15. Nice shot! We would love for other members to share their photos, too. Green and Growin' is a huge trade show for nurseries, growers, landscape companies, and anyone associated with plants. Attendees come to the Greensboro Coliseum from all over the southeast to show their wares. This event would seem to be a great venue to promote Audubon's Native Plants of the Year for Birds, right? Yes, and the folks at Audubon NC thought so too. Kim Brand, ANC's Bird Friendly Communities coordinator, reserved a booth for Audubon and asked TGPAS folks to help staff it. On Thursday and Friday of the show, Jan. 14-15, Dennis Burnette, Sarah Gilley, Barbara Hughes, Jack Jezorek, Lynn Moseley, Deborah Staves, and Ann Walter-Fromson, Pearson Audubon members, along with Don Lendle and Lisa Gould of Forsyth Audubon, held forth at the Audubon NC table. We signed up seven new nurseries for the Bird Friendly Communities program to stock native plants; 24 volunteer hours were clocked; 49 new folks signed up to get the e-bulletin about the program, bringing the total to more than 500; and eight of the existing nurseries stopped by to say hello and let us know how things were going. All in all a productive couple of days at the Green and Growin' show and for our birds. Who can forget the horrible images of thick, brown oil spewing from the British Petroleum Deepwater Horizon oil rig in the Gulf of Mexico? 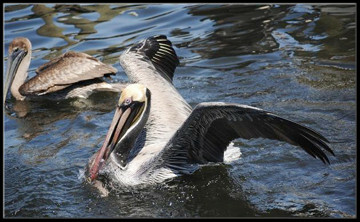 Or the dolphins and pelicans covered in that toxic brew? Fortunately, the US court system has levied heavy fines on BP to help pay for the Gulf recovery. From the very start of the recovery process National Audubon has been a leader in that effort. Our March program will bring us up to date on how that project is going from someone who has been on the front lines from the beginning. Chris Canfield is well known to many of us in Pearson Audubon, as he served for ten years as the Executive Director of Audubon North Carolina, preceding our present director, Heather Hahn. Chris moved to the Gulf region when he took his present position, but the beauty of North Carolina called him back. He spends much of his time on the road so living here and working on Gulf projects is no problem. Chris's presentation will focus on how the oil spill affected the Gulf's waterbirds and what Audubon and others are doing to help those birds recover. He will tell us about the gains that have been made and what the future holds for Gulf waterbirds and the entire Gulf region. Chris is a wonderful speaker and a very congenial Audubon colleague. Mark your calendars for what promises to be an interesting, important and meaningful program. Come a few minutes early to chat with Chris and to help us welcome him home. We'll have juice and some light refreshments starting at about 6:45. The date of our annual joint field trip to NC A&T Farm with the Piedmont Bird Club has been changed to Saturday, Feb. 27. This will be an easy walk around the farm pond and the edges of a wet woodland, and then by car across the road to more ponds, fields, and the swine research facility. This is the best site in Guilford County for Wilson’s Snipe, and we also usually see American Pipit. Carpooling is essential. Contact the trip leader, Emily Tyler, for details and to sign up for the trip: 375-5770, ettyler@triad.rr.com. Our monthly Second Sunday Nature Walk will be held on Sunday, March 13. The Laurel Bluff Trail traverses beautiful woodland and wetlands along the edge of Reedy Fork Creek. This trail is one of six Watershed Trails that have been designated as part of the North Carolina Mountains-to-Sea Trail. We will stroll through a mountain laurel grove on the trail while enjoying great views of the backwaters of Lake Townsend. The trail is 3.5 miles one way. We plan to hike as far as the group would like to go. The T. Gilbert Audubon Chapter sponsors the Laurel Bluff Trail. We will be collecting litter and removing debris off the trail along the way as part the adopt-a-trail program. As usual, we will meet at 1:45 to organize carpooling in front of the Whole Foods Market, 3202 W. Friendly Ave., Greensboro, in Friendly Shopping Center under the Sears Plaza sign facing Friendly Avenue, between BB&T and Chick-fil-A in Greensboro. We intend to depart at 2 p.m. to carpool to the Laurel Bluff Trail head on Lake Brandt Road. 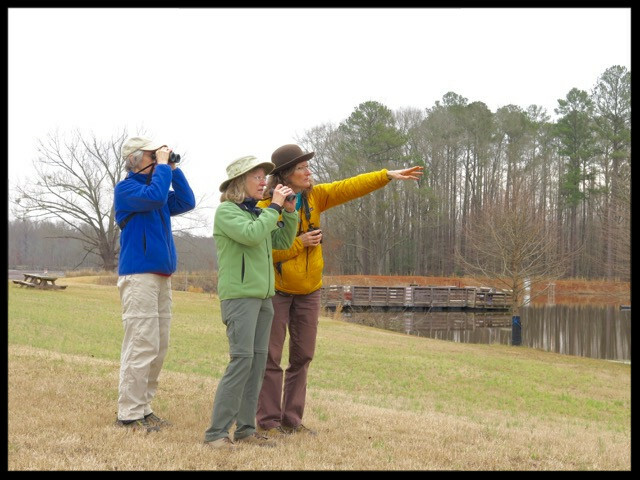 The next workshop in the TGPAS Beginning Birder series will feature “Familiar Birds of our Lawns and Parks" and will be held from 2:30-4:30 p.m. Sunday, March 20, at the KCE Family Branch Library, Price Park, in Greensboro. The series' presenter is Dennis Burnette, a retired college professor, a nature educator, and an amateur wildlife photographer. Dennis is past president of T. Gilbert Pearson Audubon Society and a current member of the TGPAS board, past president of Piedmont Bird Club, and a past vice president of the Carolina Bird Club. The topic of each of these workshops is different. Each stands alone, meaning that a participant may attend one or all and receive different material each time. The workshops include a 45-minute classroom presentation and discussion followed by 45 minutes of practicing skills outdoors. Members of TGPAS, Piedmont Bird Club, and the general public are invited to attend. 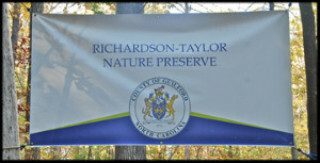 Join us on a field trip to one of the Guilford County’s premier Open Space Preserves, the Richardson-Taylor Preserve, on Saturday morning, March 26. We’ll be joining our sister chapter from the next county west of us, Forsyth Audubon Society. This preserve formerly was known to birders in our area as the “beaverdam trail.” True to its nickname, beavers are quite active in the marsh. This may be the best place in the county for Red-headed Woodpeckers. Wood Ducks often are seen, and sometimes birders get close views of Belted Kingfishers. Both Red-tailed and Red-shouldered Hawks frequent the area. By the end of March, the early spring wildflowers in the preserve will be blooming along the trail in the hardwood forest. These will attract pollinators, including species such as Falcate Orangetip butterflies, which only fly for a few weeks. We should hear several species of frogs singing when we get to the marsh. We are likely to walk about a mile or so on dirt trails, so wear sturdy walking shoes. Dress in layers for early spring weather. Bring water and also a snack as we may be in the woods and at the marsh edge for most of the morning. Binoculars and a field guide will come in handy if you have them, but come even if you don’t. Lots of people will be willing to loan you theirs. This trip will be canceled if the weather forecast is for rain all day or dangerous conditions. We will meet at 7:15 a.m. to organize carpooling with the intention of leaving at 7:30. Meet at our usual spot in Friendly Shopping Center in front of the Whole Foods Market under the Sears Plaza sign next to Friendly Avenue between the BB&T and Chick-fil-A. We will meet the Forsyth folks at the preserve at about 8 a.m. Please contact Dennis Burnette, deburnette@triad.rr.com, to let us know you’ll be participating so we’ll know how many people we’ll need to accommodate. One of the sure signs of the coming of spring in the Triad is that we begin to hear songs from those “other” singers, frogs. In mid February we were already hearing the sweet sounds of Spring Peepers and Upland Chorus Frogs. On our field trip to the Pee Dee NWR in Anson County, we heard those two plus a Cope’s Tree Frog. It won’t be long before we begin hearing them here, too. We can take these songs as evidence that spring isn’t all that far away! 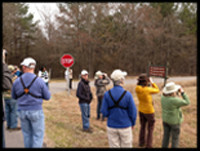 Twelve cold-hardy souls participated in the Great Backyard Bird Count workshop and bird walk at Price Park on Feb. 13. After Ann Walter-Fromson talked about the purpose and importance of this citizen science event, the group discussed the rules for counting and went outside to count birds in the park. They first watched for birds at the feeders around the library building where they saw several familiar species, then skirted the upper edge of the wet meadow and looked for birds on the pond adjacent to the library. Half of the group continued across Hobbs Road on the Price Park greenway overlooking Jefferson Lake, where they saw several species of waterfowl, including Bufflehead, Gadwall, Hooded Merganser, Ring-necked Duck, and Ruddy Duck. Carolyn Allen, Roberta Newton, and Ann Van Sant helped the newer birders in the group with species identification, and with Roberta’s scope they got good looks at the ducks on the lake. In all, they recorded 31 species on the 80-minute walk. Not bad for late morning on a cold and windy day! Plus, the group fledged four new birders who were participating the the Great Backyard Bird Count for the first time. A sunny but very cold afternoon greeted the five hardy souls who braved below freezing temperatures for last month’s Second Sunday Nature Walk on Feb. 14 at the Greensboro Arboretum. What we had billed as our “Lonely Hearts Valentine’s Day Bird Walk” wasn’t all that lonely. A surprisingly large number of people were in the park jogging, walking their dogs, and enjoying the Sunday afternoon. Our small group of nature-walkers wasn’t disappointed by the birds, either. We didn’t spot anything unusual, but we did see a beautiful Red-shouldered Hawk, many American Robins and Dark-eyed Juncos, and other "likely suspects” for this time of year. Although we enjoyed the walk, we decided to bring it to an end earlier than usual and adjourn to a nearby coffee shop to warm up where we enjoyed the hot beverages and warm camaraderie. We had a beautiful, sunny, mild winter day for our field trip to Pee Dee National Wildlife Refuge near Wadesboro in Anson County on Feb. 20. This was a joint outing with our sister chapter in the next county west of us, Forsyth Audubon Society. Pee Dee NWR is the closest refuge in the National Wildlife Refuge system to Guilford County. It was established to provide wintering habitat for migratory ducks and geese. The trip is just under two hours through beautiful southern Piedmont countryside and small towns. Twenty-three people turned out, eight of whom were TGPAS members. We birded near the refuge headquarters first where we checked a restored native grass meadow and a marsh with a boardwalk. Then we drove to the refuge’s flooded fields and shallow ponds to search for waterfowl. In addition to many land bird species such as Swamp and Savannah Sparrows and three Bald Eagles, we saw a good variety of waterfowl. These included Wood Duck. Green-winged Teal, Mallard, Northern Pintail, Northern Shoveler, Gadwall, American Wigeon, Ring-necked Duck, Bufflehead, Hooded Merganser, Ruddy Duck, Canada Goose, and American Coot. The best sighting of the day was three Tundra Swans, unusual this far inland. Two Pileated Woodpeckers delighted those who were quick enough with their binoculars to catch them before they flew away. We also noted other wildlife. We saw what appeared to be signs of River Otter on the marsh boardwalk; heard three species of amphibians, Upland Chorus Frog, Spring Peeperm and Cope’s Tree Frog; and noted several late winter wildflowers beginning to bloom. Like T. Gilbert Pearson Audubon Society on Facebook!